Midway through an anxious fourth season in the AHL, defenceman Ryan Graves rejoined his Colorado Eagles teammates in San Jose after the Christmas break, when he was greeted in the hotel lobby by his coach, Greg Cronin. Cronin told Graves the good news. He had been called up by the Colorado Avalanche. Finally, after 254 AHL games, the 23-year-old from Yarmouth, Nova Scotia, was going to the show. Graves was informed he would stay in San Jose to practice with the Eagles that afternoon and then fly out to meet the Avalanche in Las Vegas. He would be in the lineup for Colorado’s game against the Golden Knights Dec. 27. Graves scored his first goal in his fifth game with the Avalanche Jan. 4 against the team that drafted him, the New York Rangers. He seemed destined to play for the Rangers. After all, he shared the same surname as one of the most popular Blueshirt players from the 1993-94 Stanley Cup team, Adam Graves. There is no relation between the two. But they immediately hit it off after the Rangers selected the younger Graves in the fourth round (110th overall) at the 2013 draft in Newark, New Jersey. Back then Adam Graves was part of the development department for the Rangers. He would visit Ryan in junior in his final three stops in the QMJHL with the Charlottetown Islanders, Val-d’Or Foreurs and Quebec Remparts as well as with the Hartford Wolf Pack in the AHL. The two would discuss the game and Adam would often offer his advice as his protégé developed. “I know Adam quite well,” said Ryan, who played in the 2016 AHL all-star game and won the hardest shot contest. “He’s a super, classy individual and was always there for me." The older Graves was moved into a community relations role with the Rangers before moving into hockey and business operations with the club, and the younger Graves was dealt at the 2018 trade deadline to the Avalanche in exchange for defenceman Chris Bigras. Ryan Graves had to prove himself all over again. He made an impression with the Avalanche brass in training camp last fall but began the season in the AHL. In his final two junior seasons, his development accelerated with two deep playoff runs. The Foreurs won the 2013-14 President’s Cup, went to the Memorial Cup and Graves was named to the tournament all-star team. He helped the Remparts advance to the seventh game of the league final the following season, only to be beaten by the Rimouski Oceanic in the championship finale in double-overtime. “It was huge for my development,” Graves said. “I feel as a young player you develop the most in the playoffs. My first time in Val-d’Or I feel I came out of my shell. I contributed even more in Quebec City as a player and as a leader. 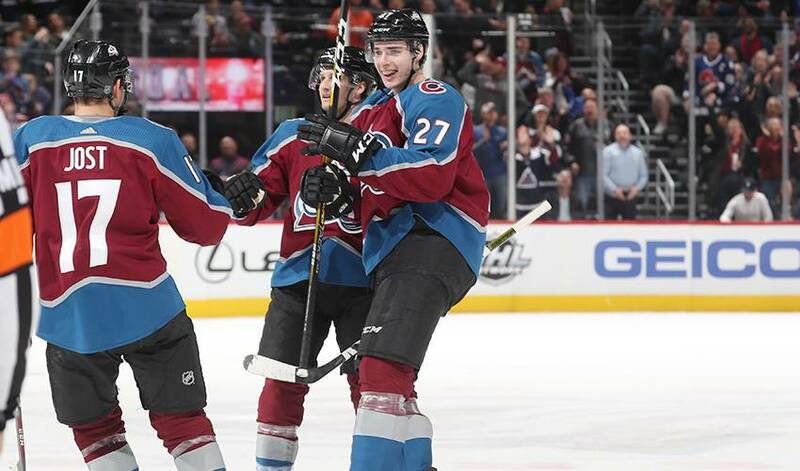 When he joined the Avalanche in late December Graves was reunited with Nathan MacKinnon. Graves was born 103 days before his fellow Nova Scotian and grew up a three-and-a-half hour drive from MacKinnon’s hometown of Cole Harbour. They played against each other in minor hockey and in junior. They also were teammates on some summer-time provincial teams as well as for Nova Scotia at the 2011 Canadian Winter Games, and for Team Atlantic at the 2012 World Under-17 Challenge. “It’s been pretty cool,” said Graves, now is in his second stint with the Avalanche after a brief demotion to the Eagles in mid-January. “You always knew Nathan was going to be a star, while the rest of us were trying to develop and get to this level.